This new type of permeable concrete is designed to combat flash flooding. Now that might not sound extremely exciting, but watch the video. The capacity of the concrete is mind boggling. They dumped 4000 liters of water on it and it barely formed a puddle. 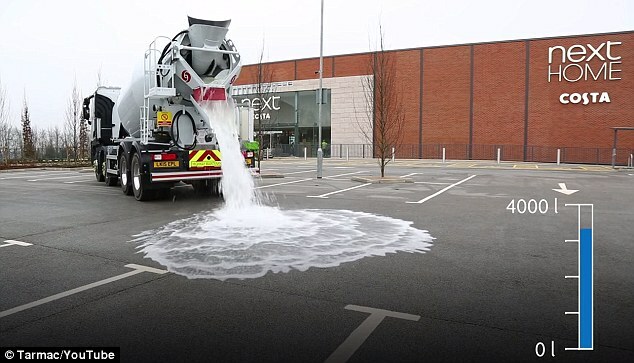 It’s called ‘Topmix Permeable concrete’ and is developed by Birmingham based Lafarge Tarmac. Floods mostly occur when ground water that has nowhere to go once the drains are full. However, Topmix permeable concrete allows water to drain through the surface to the underlying ground, meaning it also has the ability to act as a reservoir. In addition to preventing surface water flooding during storms, the concrete could also help to make roads or cycle paths safer by preventing puddles. Furthermore, it reduces the heating of road surfaces in hot weather. The only problem is that it doesn’t work in cold climates. If water freezes when inside the reservoir it causes cracks and not only ruins the concrete surface, but also renders the system useless. However the company says it’s working on fixing that. The 100% biodegradable Iphone case! profesional además de ofrecer la posibilidad de visitarnos en nuestras tiendas de iluminación led realizar el pedido a través de la tienda online de bombillas led. handle the online payments for these humanitarian activities. connected to the Linked – In account.